Some years ago Council decided to develop a walk from Chatswood Station to Fullers Bridge on the Lane Cove River (where it would connect to the Great North Walk and the Lane Cove River Walk). The plan was to route the walk through as much open space as possible. The upper part of the walk from the station to Swaines Creek follows the track that Charlotte (Chattie) Harnett used to wonder of an afternoon. (Chatswood was named after Chattie). The bulk of the walk is on public land. 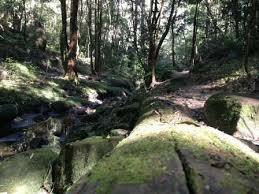 However, one small section of the walk needed to transverse a small section of land owned by Chatswood Golf Club. It was assumed that since Council leases land for 3 golf holes to the Club that the Club would agree public access across this small portion of land. Unfortunately, this was not the case. So, the walk had to be interrupted when it was progressing down the Swaines Creek gully. At Greville Street, the walk is diverted by Fullers Rd and Bellevue St before reentering open space at O.H. Reid Oval. Council is about to renew the lease of public land to the Golf Club. Council and the Club have recently informed the community that a Memorandum of Understanding granting public access across the small portion of private land would be signed before any lease renewal. However, the lease renewal is going to Council on 27th April 2014. There is no mention of the MOU. We have asked Clr. Saville to action to ensure that Council and the Club live up to their promises. I was also given an assurance by council staff that the golf club was cooperating on opening up access to the track in question and that it would be dealt with as part of the new lease. It will be disappointing if for some strange reason council goes soft on the issue. From the golf club perspective it should be an easy give as it has zero impact on course itself…..
A public walking trail is accessed along the Lane Cove River and Swaines Creek foreshores with a further link connecting OH Reid Reserve to Ferndale Park using bushland owned by the Club. The Club has agreed to enter into a Memorandum of Understanding (MOU) with Council for public access across the Club-owned land with the MOU to be finalised and entered into prior to the execution of the lease agreements.